As far back as Roman times, strawberries have been used to alleviate inflammation, reduce fever, cure gout, improve bad breath, and more! When combined with basil (which has both antibacterial and anti-inflammatory properties) and lime, this tasty treat becomes a powerhouse of health benefits. Place the strawberries and basil in a glass serving bowl or pitcher. Sprinkle sugar over it and lightly smash the ingredients together, softening the strawberries and slightly crushing the basil leaves. Lightly is the operative word here—you don’t want to turn this into a pulp! Pour lime juice, gently stir, and allow to sit for a least a few minutes. If serving in individual glasses, place a few ice cubes in each glass and spoon the mixture over the ice with bubbly water. Garnish with sliced strawberries, lime round, and a sprig of basil. 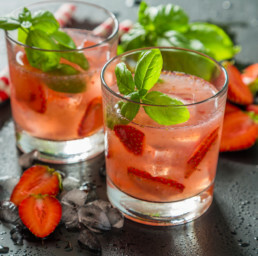 If serving in a pitcher or bowl, gently combine the strawberry mixture with ice and desired amount of bubbly water, and float the garnish on top.